THE Australian national meat judging team was announced in Brisbane last week, with five of the best students set to represent their country on a USA tour in January 2019. This year’s national representatives will be Lauren Smith (Murdoch University), Jess Davis (University of Sydney), Nikita Ellison (University of Queensland), Felicity Brumpton (University of New England) and Jessie Phillips (Charles Sturt University). Along with coaches Nick van den Berg (ICMJ Committee, Meq Probe), and Sarah Stewart (ICMJ Committee, Murdoch University). The team of five were selected after making it through to the top 10 in the Senior Competition held in Wagga earlier in the year. Accompanying these students was the Coaches XI, who were selected on their aptitude and keen interest expressed throughout the Wagga competition. 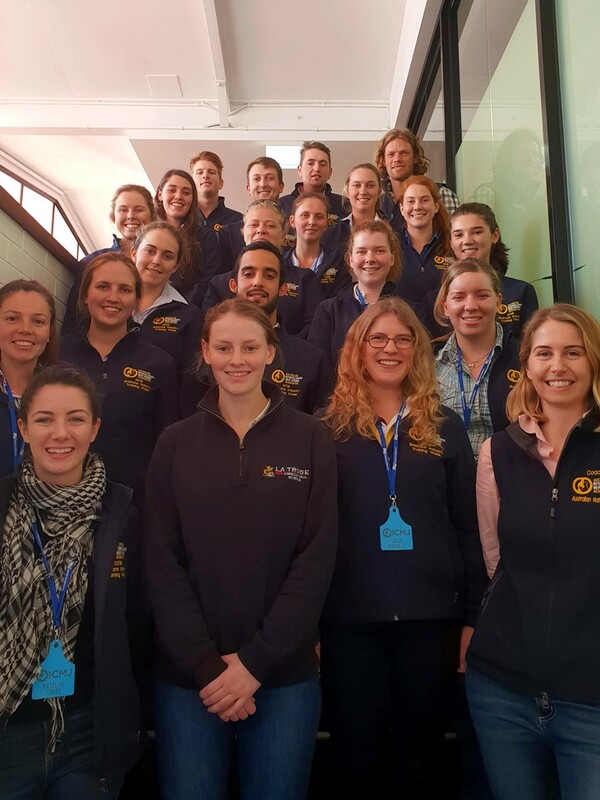 The training involved a six-day tour across Queensland to train and develop 19 Agricultural, Animal, Rural and Veterinary science students from 10 universities across Australia. “It was an incredible opportunity to see the supply chain systems that not all producers get to see and to see what future careers there are out there in the red meat industry for university students like myself” said recently selected Australian representative Felicity Brumpton. ICMJ President, Dr Peter McGilchrist was very pleased with the selections. He is hopeful for the team to back the highly successful team of January 2018. “This group of students will be our future coaches of ICMJ and leaders of the Australian meat industry” he said. The group had a full-on and enriching week, visiting AA Co, ACC, Comm group, Peter Augusts butcher shop, New Farm Deli, MLA, Super Butcher, Scenic Rim Dairy, Oakey Beef, NH foods, Mort and co, Jim’s Jerky, UQ dairy and beef research centre, JBS Dinmore and Sunpork fresh food processing eagle farm. They also heard from Australian ICMJ founding member, Jason Strong. Jack Cook, from Sydney University said “it was a fantastic week that provided me with an insight into the incredible meat industry and the opportunity to meet the awesome community involved in it”. The week allows students to gain insight into innovative measures processor and producers are employing to remain competitive on a global stage into the future. But it also is designed to give an intensive snapshot of the inner workings of the various red meat supply chain from paddock to plate with visits to a range of food service, retail and whole sale meat providers right through to processors and feedlots. The US trip continues the educational period with five students gaining the opportunity to develop insights behind one of our major trading partners in the meat industry, with a month-long tour in January. The five-member team touring in 2019 will be represented for the first time by five different universities, highlighting the reach and strength of the ICMJ program nationally. “ICMJ will be celebrating 30 years this coming July, and it’s safe to say the program has played a role in the development in over 3000 meat and livestock industry professionals” they said. ICMJ is principally funded by MLA and AMPC, along with industry contributions from a range of Australian companies including Coles, Teys, APL, JBS, AA Co, Mort & Co and NH Foods.